Infection or inflammation of the skin recruits effector CD8+ T cells that enter the epidermis and form populations of long-lived tissue-resident memory T (TRM) cells. These skin TRM cells migrate within the constrained epidermal environment by extending multiple dynamic dendritic projections and squeezing between keratinocytes to survey the tissue for pathogens. In this study, we examined the signals required for this distinctive mode of T cell migration by inhibiting key cytoskeletal components and performing intravital two-photon microscopy to visualize TRM cell behavior. We found that TRM cell motility and dendrite formation required an intact actomyosin cytoskeleton and the Rho-associated coiled-coil containing kinases. We also identified an essential role for microtubules for maintaining skin TRM cell shape and cellular integrity. 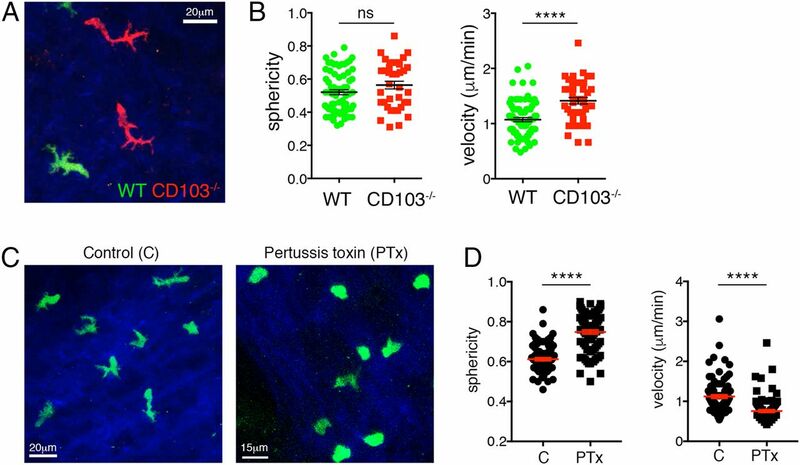 We reveal a role for pertussis toxin–sensitive signaling for TRM cell dendritic morphology and migration that is independent of CXCR3 or CXCR6, or the skin-selective chemokine receptors CCR10 and CCR8. However, we found that CXCR6 and CCR10 expression by CD8+ T cells was required for the optimal formation of memory T cell populations, in particular TRM cell populations in the skin. T cells are important for protection from pathogens and tumors. Following the clearance of a pathogen, populations of memory T cells develop with different functional, phenotypic, and migratory properties (1). Subsets of memory T cells, referred to as central and effector memory T cells, recirculate via the blood through secondary lymphoid organs, returning to the circulation via the lymphatics. Effector memory T cells can also migrate through nonlymphoid tissues before returning to lymph nodes (LN) via lymphatics. Notably, nonlymphoid tissues also contain a substantial proportion of nonrecirculating, tissue-resident memory T (TRM) cells (2). These cells can persist for long periods in tissues without exiting into the bloodstream. TRM cells have been observed in most tissues and organs in mice, and in many tissues in humans. CD8 and CD4 memory T cell populations are found in tissues, often with clear differences in the localization of these two subsets within the microarchitecture of tissues such as the skin, intestines, lungs, and reproductive tract (1, 3). TRM cells are defined on the basis of expression of the markers CD69 and the integrin αE chain, CD103. Additionally, TRM cells have been shown to express a transcriptional profile distinct from that of recirculating memory T cells and related to that of populations of tissue-resident innate lymphoid cells (4, 5). Notably, TRM cells in different nonlymphoid tissues possess unique gene expression signatures, indicating that local signals shape the development of memory T cells resident in different tissues. Upon re-exposure to a pathogen, TRM cells can contribute to early protection by releasing cytokines that stimulate local innate immunity and help to recruit T cells from the blood (6, 7). Integral to this ability to respond rapidly upon reinfection, TRM cells within tissues perform key local immunosurveillance functions. These cells do so by migrating constantly within the nonlymphoid tissue environment, increasing the probability of contact with infected cells or APCs (8, 9). In the skin, CD8+ TRM cells are restricted to the epidermis and hair follicle epithelium (10). In contrast to T cells within the dermis that have an amoeboid shape and relatively fast speed of migration (∼6 μm/min), TRM cells within the epidermis adapt a striking dendritic morphology and slow mode of migration (1–2 μm/min). This slow random migration promotes the long-term persistence of TRM cells at sites of prior infection in the skin and may enhance local immunosurveillance by enhancing the ability of cells to scan the environment (8, 9). Although the epidermal environment appears to enforce a constrained mode of migration in skin TRM cells, what signals control the morphology and motility of these cells are not known. The range of signals that influence TRM cell formation and persistence within tissues, including the skin, are just beginning to be determined. Signaling through the TGF-β receptor and aryl hydrocarbon receptor, IL-15 signals, as well as CD103 and CD69 expression, are each required for skin TRM cell development or persistence (5, 11, 12). Furthermore, downregulation of key molecules required for T cell trafficking, including CCR7, S1PR1, and KLF2, as well as regulation of T-bet and Hobit are central to tissue residence by enforcing a gene expression program that prevents migration of TRM cells out of the tissues (4, 5, 11, 13). Whether other chemokine or cytokine receptors also contribute to skin TRM cell formation, migration, or persistence needs to be determined. We have examined signals controlling TRM cell morphology and motility in the skin of mice, using intravital two-photon microscopy to track T cells in real time. Via the topical application of various inhibitors to the skin, we could directly alter TRM cell behavior. This revealed key roles for actin polymerization and myosin-II, as well as the Rho-associated coiled-coil kinases (ROCK) for TRM cell dendritic morphology, and a critical role for microtubules for maintaining TRM cell shape. Skin TRM cells required pertussis toxin (PTx)–sensitive signals for motility, yet the chemokine receptors CXCR3, CCR8, CXCR6, and CCR10 were not required. However, CD8+ T cells lacking expression of CXCR6 or CCR10 formed reduced numbers of skin TRM cells, and lack of CCR10 also impaired numbers of circulating memory T cells, demonstrating a role for CCR10 for T cell priming and memory formation after skin infection. C57BL/6J, B6.SJL-Ptprca Pep3b/BoyJ (B6.CD45.1), gBT-I.CD45.1, gBT-I.EGFP, gBT-I.dsRed, gBT-I.EGFP Itgae−/− (CD103−/−), gBT-I.CCR10−/−, gBT-I.EGFP CCR8−/−, OT-I.EGFP CXCR3−/−, and CXCR6−/− mice were used in this study. gBT-I mice encode transgenes expressing TCR recognizing the HSV glycoprotein B–derived epitope gB498–505. CCR10-deficient (EGFP knock-in) mice were from Lu and colleagues and C. Gerard (14). Animal experiments were approved by The University of Melbourne Animal Ethics Committee. Epicutaneous infection with HSV-1 KOS was performed as described elsewhere (15). Briefly, mice were anesthetized with a 1:1 mixture of ketamine and Xylazil (10 μl/g body weight) by i.p. injection. Hair was removed from the left skin flank and depilated (Veet; Reckitt Benckiser). Scarification was performed by lightly abrading the skin using a grindstone tip of a rotary tool (Dremel) and infected with 106 PFUs of HSV. Formulations of inhibitors were prepared for transcutaneous delivery. Cytochalasin D (20 μg), blebbistatin (50 μg), or Y27632 (50 μg) were mixed with acetone (in an 80 μl vol). Colchicine (50 μg) or PTx (100 ng) was added to 100 mg of Sorbolene cream and mixed thoroughly. Compounds mixed in acetone were applied to the skin using a 200-μl micropipette. Compounds mixed in Sorbolene were applied and the mixture was contained on the skin using a bandage consisting of an adhesive film (OpSite Flexigrid; Smith & Nephew) and surgical tape (Micropore tape, 3M). The mixture was allowed to absorb through the skin for 3 h prior to removal of the bandage. Mice were imaged 8–10 h after application. Mice were euthanized by CO2. Mice were perfused with PBS and 1 cm2 skin regions were excised. Skin samples were placed into dispase (2.5 mg/ml in PBS) and incubated at 37°C for 90 min, then placed into collagenase type III (3 mg/ml in RPMI 1640 plus 10% FCS and 5 μg/ml DNase I), finely chopped and further incubated at 37°C for 30 min. Samples were transferred into RPMI 1640 plus 10% FCS, and vigorously mixed. Cells were successively filtered through 70- and 30-μm nylon meshes and resuspended in FACS buffer (PBS with 2% FCS, 5 mM EDTA, 0.1% NaN3), prior to Ab staining. LN and/or spleens were harvested and pushed through a 70-μm sieve to obtain single-cell suspensions and resuspended in FACS buffer for Ab staining. Propidium iodide was added to samples prior to acquisition by flow cytometry (BD FACSCanto or LSRFortessa). Data were analyzed using FlowJo software (Tree Star). The following Abs were purchased: BD Pharmingen: Vα2-PE-Cy7 (B20.1) and CD69-PE ( 1H.2F3); eBioscience: CD3e-PerCP-Cy5.5 (145-2C11), CD44–Alexa Fluor 700 (IM7), CD8α–allophycocyanin–eFluor 780 (53-6.7), CD62L-PerCP-Cy5.5 (MEL-14), CD45.1-FITC (A20), CD45.1-PE (A20), and CD45.2–Alexa Fluor 700 (104); and BioLegend: CD103-allophycocyanin (2E7). gBT-I T cells were incubated with 5 μM CellTrace Violet at 37°C for 10 min and washed in complete media. T cells were then adoptively transferred i.v. into recipient mice prior to infection as described above. For in vitro–generated effector CD8+ T cells, splenocyte samples enriched for CD8+ T cells were activated by anti-CD3ε (5 μg/ml; clone 145-2C11; eBioscience) and anti-CD28 (5 μg/ml; clone 37.51). Activated CD8+ T cells (5 × 106) were transferred at a 1:1 ratio of wild-type (WT) and CXCR3−/− or CXCR6−/− cells into recipients by intradermal injection (five 20-μl injections over an area of skin 1 × 1.5 cm2) with a 30-gauge needle. Mice were shaved and depilated before the application of 15 μl 2,4-dinitrofluorobenzene (DNFB) in acetone/oil (4:1) to a 1-1.5 cm2 area of skin 24 h prior to T cell transfer. Intravital imaging of the skin flank was performed as described elsewhere. Briefly, mice were anesthetized with isoflurane (Cenvet; 2.5% for induction, 1–1.5% for maintenance, vaporized at 80:20 mixture of O2 and air), shaved on the left flank, and hair was depilated. Two incisions (∼15 mm apart) were made longitudinally along the left flank to contain the herpes lesion site. Subcutaneous connective tissue below the dermis was carefully cut away from the dermis and an 18-mm-wide × 1-mm-thick stainless steel platform was inserted under the exposed dermis, upon which the underside of the dermis was attached using Vetbond tissue adhesive (3M). The edges of the skin were lined with vacuum grease (Dow Corning), warm PBS was placed on top of the skin, and a glass coverslip was carefully positioned. Imaging was performed with an upright LSM 710 NLO multiphoton microscope (Carl Zeiss) with a ×20/1.0 numerical aperture water immersion objective enclosed in an environmental chamber (Precision Plastics) maintained at 35°C with heated air. Fluorescence excitation was provided by a Chameleon Vision II Ti:Sapphire laser (Coherent) with dispersion correction and fluorescence emission detected using external nondescanned photomultiplier tubes. EGFP and second harmonic generation (SHG) were excited at 920 nm, whereas samples with dsRed and EGFP were excited at 900 nm. For four-dimensional data sets, three-dimensional z-stacks (40 μm thick) were acquired every 60 s for 45–60 min. Raw imaging data were processed using Imaris (Bitplane). Cells were surface-rendered using Imaris surface module to generate sphericity data. Videos generated in Imaris were composed in After Effects (Adobe). Comparison of data sets was performed using Kruskal–Wallis tests with a Dunn posttest or Mann–Whitney U test where appropriate. T cells that enter the epidermis acquire a dendritic morphology and low migrational velocity that become more pronounced after the resolution of infection (8–10). The shape of skin CD8+ TRM cells is highly dynamic during the process of migration within the constrained epidermal layer, and it appears unique from the mode of migration used by T cells in other tissues (16). We performed intravital two-photon microscopy on the flank skin of anesthetized mice to visualize HSV-specific gBT-I CD8+ TRM cells in the epidermis. We observed elongated cell bodies and persistent extension and retraction of dendritic protrusions from the TRM cells as they navigated the epidermis (Fig. 1A). Many of the smaller protrusions appeared to resemble lamellipodia, suggesting that the cells probed their environment to move and make directional decisions. Cytoskeletal components required for TRM cell morphology and motility in the skin. (A) gBT-I.GFP CD8+ T cells (green) imaged by two-photon microscopy in the skin >30 d after HSV infection. SHG (blue) delineates the collagen-rich dermis. Scale bar, 5 μm. (B) Intravital images of gBT-I.GFP T cells in skin treated with the indicated compounds dissolved in acetone (vehicle). Two examples are shown for each condition, at different magnifications. (C) Disruption of microtubules by treatment with colchicine results in pronounced elongation of skin TRM cells and fragmentation of some cells. Four examples from different regions of skin are shown. (D) Morphology of skin TRM cells after treatment with the indicated agents. Sphericity measurements for individual cells are plotted. Red lines are mean ± SEM. Means: acetone, 0.62; cytochalasin D, 0.75; blebbistatin, 0.71; Y27632, 0.77; colchicine, 0.65. (E) Mean velocity of TRM cells migrating within the epidermis after treatment with the indicated agents. Red lines are mean ± SEM. Means (μm/min): acetone, 0.75; cytochalasin D, 0.52; blebbistatin, 0.63; Y27632, 0.57; colchicine, 0.84. Data are shown from two to three independent experiments. n = 5–6 mice per condition, one to two videos per mouse, 92–136 individual cells. *p < 0.05, ****p < 0.0001. ns, not significant. To best understand the molecular mechanisms controlling the behavior of skin CD8+ TRM cells, in situ analysis of cell movement was required. To influence this behavior, we applied various compounds topically to the skin of mice. We developed a protocol to apply nonaqueous compounds dissolved in acetone topically to the shaved skin of mice. Skin TRM cells treated with vehicle alone (acetone) displayed no change in their morphology or motility (Fig. 1B) compared with untreated TRM cells (8). Because polymerization of actin is crucial for cell migration and morphology, in particular to control cell shape and cytoplasmic projections (17), we first examined the effect of disrupting the actin cytoskeleton of skin TRM cells. Examination of the skin of the mice after treatment did not reveal obvious changes or disruption of the epidermis or underlying SHG+ dermis. Compared to mice treated with vehicle alone, treatment with the actin depolymerization compound cytochalasin D induced marked rounding of the TRM cells and a significant reduction in cell motility (Fig. 1B–E, Supplemental Video 1). Because T cells also require myosin-II for motility, at least for amoeboid modes of migration (18), we treated the skin of mice with the compound blebbistatin to inhibit myosin-II function. TRM cells rounded up and reduced motility after blebbistatin treatment, although some cells retained the ability to extend some small dendritic projections, albeit with a reduced motility (Fig. 1B–E). We then examined a role for the Rho GTPase ROCK for TRM cell motility. ROCK has been shown to play an important role in T cell migration within constrained environments by activating myosin-IIA–mediated actomyosin contraction (19). In dendritic cells ROCK is also important for dendrite formation (20). Treatment of skin with the ROCK inhibitor Y27632 induced reduced formation of dendritic projections by the TRM cells and inhibited motility (Fig. 1). We also treated mice with a Rac1 inhibitor, NSC1, to determine a role for branched actin formation and membrane protrusions; however, no difference was observed between treated and untreated mice (data not shown). This could be due to compensation by Rac2, which is also required for T cell migration (21). Next, we examined a role for microtubules for TRM cell migration. Microtubules are important for organization of cytoskeletal structures to stabilize cell uropods and lamellopodia, and microtubule retraction may help cells to migrate through confined spaces (22, 23). Treatment of TRM cells in the skin with the microtubule destabilization agent colchicine resulted in a marked change in the morphology and behavior of the cells (Fig. 1C–E, Supplemental Video 1). We observed marked elongation of TRM cells, some extending dendrites for 30–40 μm, yet retaining a rounded and sessile cell body. We also observed rounded cells and substantial cell debris that was indicative of cell death. Although some cells appeared to migrate normally after treatment, we were unable to confirm that the compound evenly penetrated across the skin. Notably, we saw similar effects on skin TRM cell morphology and migration after treatment with another microtubule-destabilizing agent nocodazole (Supplemental Fig. 1A). These data show that skin TRM cells use actin-driven migration machinery, including the Rho GTPase ROCK and myosin-II, to adopt a unique dendritic morphology and migrate within the epidermis. Notably, skin TRM cells also require an intact microtubule network to migrate and maintain cellular integrity within the epidermis. T cells resident in the epidermis after infection or inflammation express high levels of the integrin αE chain, CD103 (24), which binds to the ligand E-cadherin. Although CD8+ T cells that lack expression of CD103 can initially enter the epidermis and develop into TRM cells, persistence of these cells over time is impaired (5). It was previously demonstrated that skin dendritic epidermal γδT cells lacking CD103 had fewer dendrites in vivo and showed slower motility in vitro (25). To investigate the role for CD103 expression by CD8+ TRM cells, we cotransferred CD103−/− and WT HSV-specific TCR transgenic CD8+ T cells from gBT-I mice into WT recipients. Following infection with HSV, we imaged both WT and CD103−/− epidermal TRM cells. CD103−/− TRM cell morphology was equivalent to that of WT cells (Fig. 2A, Supplemental Video 2). Tracking of the cells revealed greater motility by CD103−/− TRM cells compared with WT cells (Fig. 2B). These data suggest that CD103 expression may contribute to TRM cell adhesion in the epidermis and thereby influence local retention. However, the unique cell morphology of skin TRM cells was not influenced by expression of CD103. (A and B) CD103 restrains cell motility but does not influence TRM cell morphology in the skin. (A) Representative image of WT (green) and CD103−/− (red) gBT-I CD8+ TRM cells after HSV infection. Mice were cotransferred with equal numbers of WT and CD103−/− gBT-I cells prior to skin HSV infection. (B) Sphericity measurements and average velocity of WT and CD103−/− CD8+ TRM cells in the skin >30 d postinfection. n = 6 mice, one to two videos per mouse, 42–78 individual cells. Black lines are mean ± SEM. Mean sphericity: WT, 0.52; CD103−/−, 0.56. Mean velocity (μm/min): WT, 1.07; CD103−/−, 1.41. (C and D) PTx-sensitive signals control TRM cell migration in the skin. (C) Representative images of gBT-I CD8+ TRM cells treated with PTx or vehicle (control). (D) Sphericity measurements and average velocity of gBT-I CD8+ TRM cells in the skin after PTx or control treatment. n = 6 mice, one to two videos per mouse, 89–92 individual cells. Red lines are mean ± SEM. Mean sphericity: WT, 0.61; PTx, 0.75. Mean velocity (μm/min): WT, 1.12; PTx, 0.76. Data are shown from two independent experiments. ****p < 0.0001. ns, not significant. We next sought to determine other signals capable of influencing TRM cell formation and behavior in the skin. We treated the flank skin of mice with PTx dissolved in Sorbolene cream to inhibit Gαi protein–coupled receptors. In contrast to vehicle treatment, PTx induced rounding of skin CD8+ TRM cells and a substantial loss of dendritic projections (Fig. 2C, 2D, Supplemental Video 3). Some TRM cells retained the ability to extend cytoplasmic projections and “wiggle” their cell bodies back and forth. However, the overall behavior of the cells was markedly altered, indicating that G protein–coupled receptors are required for TRM cell morphology and motility. Because PTx can inhibit chemokine receptor signaling, which may contribute to TRM cell behavior, we examined the roles of chemokine receptors involved in CD8+ T cell responses and homing to the skin. We recently demonstrated that expression of CXCR3 on effector T cells was important for entry of TRM cell precursors into the epidermis, and fewer TRM cells formed from CXCR3−/− T cells (5). We sought to determine whether the migration of skin TRM cells or their dendritic morphology required expression of CXCR3. We transferred equal numbers of in vitro–activated WT and CXCR3−/− T cells into WT mice and then treated the flank skin with the contact-sensitizing agent DNFB to recruit T cells into the skin where they formed populations of CD69+CD103+ TRM cells (Supplemental Fig. 1B) (26). Intravital imaging revealed that TRM cells lacking CXCR3 displayed equivalent cell morphologies and motility compared with WT cells (Fig. 3A, 3B, Supplemental Video 4), suggesting that CXCR3 signals are not required for TRM cell migration in the epidermis. (A and B) CXCR3 does not influence skin TRM cell morphology or motility. (A) Representative image of WT (red) and CXCR3−/− (green) OT-I CD8+ TRM cells >30 d after DNFB treatment. (B) Sphericity measurements and average velocity of WT and CXCR3−/− TRM cells in the skin. n = 7 mice, one to two videos per mouse, 76–163 individual cells. Black lines are mean ± SEM. Mean sphericity: WT, 0.72; CXCR3−/−, 0.73. Mean velocity (μm/min): WT, 1.52; CXCR3−/−, 1.45. (C–E) CCR8 expression is not required for skin TRM cell formation or migration. (C) Representative image of WT (red) and CCR8−/− (green) gBT-I TRM cells 60 d after HSV infection. (D) Sphericity measurements and average velocity of WT and CCR8−/− TRM cells in the skin. n = 7 mice, one video per mouse, 54–115 individual cells. Black lines are mean ± SEM. Mean sphericity: WT, 0.68; CCR82/2, 0.70. Mean velocity (μm/min): WT, 1.07; CCR8−/−, 1.00. (E) Mice were cotransferred with equal numbers of WT and CCR8−/− gBT-I cells prior to skin HSV infection. Cell numbers were enumerated in the spleen and skin 10 and 30 d postinfection. n = 8–10 mice per time point. ns, not significant. We next examined the role of CCR8, because we found that this chemokine receptor was highly expressed specifically by skin TRM cells (5). We examined whether the migration or morphology of skin TRM cells was altered in the absence of CCR8. However, we observed no difference in the morphology of the two populations, and both displayed a similar rate of motility in the skin (Fig. 3C, 3D, Supplemental Video 4). 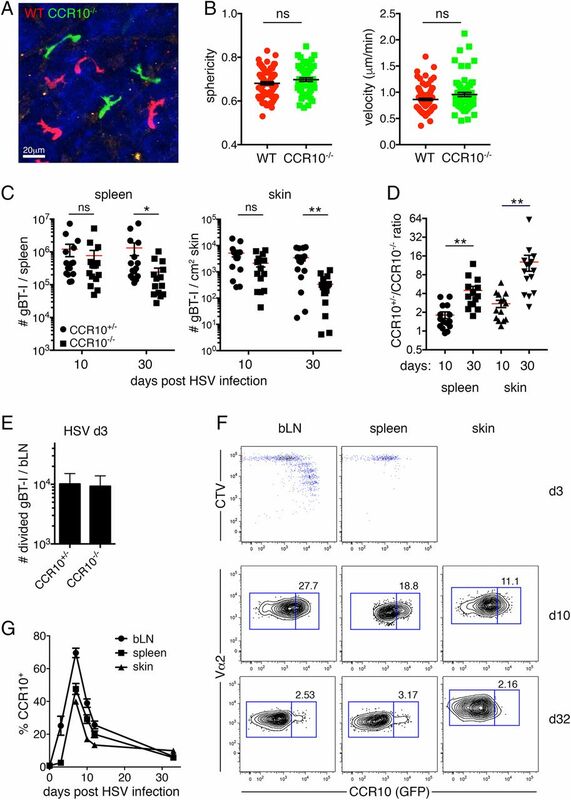 We then cotransferred WT and CCR8−/− gBT-I CD8+ T cells into mice prior to skin HSV infection and examined T cell responses in the draining brachial LN (bLN), spleen, and skin. Equivalent numbers of WT and CCR8−/− CD8+ T cells were found in all tissues 10 d after skin HSV infection (Fig. 3E), indicating that expression of CCR8 was not required for T cell responses or migration to the skin. Likewise, numbers of skin TRM cells that formed after infection were equivalent between populations of WT and CCR8−/− T cells. Therefore, despite increased expression of CCR8 by skin TRM cells, we did not find a role for expression of this chemokine receptor for formation, persistence, or migration of these memory T cells. T cells resident in several tissues, including the skin, express the chemokine receptor CXCR6 (4). The ligand for CXCR6, CXCL16, can be expressed by keratinocytes as well as dendritic cells in various tissues. TRM cells in the liver express high levels of CXCR6, and expression of this receptor contributes to maintenance of memory cells in this site (27, 28). We examined a role for this chemokine receptor using homozygous CXCR6GFP/GFP knock-in mice (CXCR6−/−), comparing T cells from these mice with WT cells. TRM cells generated following DNFB treatment were imaged in the skin, revealing that cells lacking CXCR6 showed more rounded cell morphologies, whereas migration in the epidermis was unaffected (Fig. 4A, 4B, Supplemental Video 4). We also observed a marked reduction in numbers of CXCR6−/− TRM cells in the epidermis (WT, 42.3 ± +7.5 cells/mm2; knockout [KO], 6.8 ± 1.6 cells/mm2 skin from six mice). CXCR6 is required for skin TRM cell formation. (A and B) Influence of CXCR6 on TRM cell formation and morphology. (A) Representative image of WT (red) and CXCR6−/− (green) CD8+ TRM cells >30 d after DNFB treatment. Low numbers of CXCR6−/− TRM cells were observed in most regions of skin. (B) Sphericity measurements and average velocity of WT and CXCR6−/− TRM cells in the skin. n = 6 mice, one to two videos per mouse, 60–83 individual cells. Black lines are mean ± SEM. Mean sphericity: WT, 0.72; CXCR6−/−, 0.75. Mean velocity (μm/min): WT, 1.42; CXCR6−/−, 1.34. (C) Mice were cotransferred with equal numbers of WT and CXCR6−/− gBT-I cells. Cell numbers were enumerated in the spleen and skin 10 and 30 d after transfer and DNFB treatment. n = 10 mice per time point. (D) Numbers of CXCR3−/− or WT CD8+ T cells in the spleen or skin (CD69+CD103+) from recipient mice given intradermal cotransfer of in vitro–activated cells, assessed at various times (horizontal axes) after transfer. n = 9 mice per time point. Data are shown from two independent experiments. **p < 0.005, ***p < 0.001, ****p < 0.0001. ns, not significant. To examine the influence of CXCR6 expression on memory T cell formation, we cotransferred activated WT and CXCR6−/− CD8+ T cells into mice prior to DNFB treatment and examined T cell responses. Equivalent numbers of WT and KO CD8+ T cells were found in the spleen (Fig. 4C). However, numbers of CXCR6−/− T cells were reduced in the skin by day 10 and significantly fewer CD69+CD103+ TRM cells formed in the skin. Intradermal injection of in vitro–activated CXCR6−/− CD8+ T cells to distinguish potential defects in recruitment versus retention of these cells in the skin revealed decreased numbers of TRM cells compared with WT T cells (Fig. 4D). The CXCR6−/− and WT T cells were present in similar numbers in the spleen, indicating that poor survival of the CXCR6−/− T cells may have contributed to the reduced retention and formation of TRM populations in the skin. These data identify an important role for the chemokine receptor CXCR6 for the formation of TRM cells in the skin. We next examined a role for CCR10 in TRM cell formation and migration in the skin. CCR10 is a chemokine receptor implicated in the homing of T cells to the skin (29), and CD8+ T cells have been shown to be reduced in the skin of CCR10-deficient mice (30). The ligand for CCR10, CCL27, is highly expressed in the epidermis (29). To examine CCR10 in the context of skin infection, WT and CCR10−/− gBT-I T cells were cotransferred into CCR10+/− mice prior to HSV infection and 30 d later, the memory T cell populations that formed in the skin were imaged by intravital two-photon microscopy. The morphology and motility of skin CCR10−/− and WT TRM cells was indistinguishable (Fig. 5A, 5B, Supplemental Video 4). These results indicated that expression of CCR10 by skin TRM cells was not required for migration. However, we observed that numbers of CCR10−/− TRM cells were slightly reduced (WT, 71 ± 7.5 cells/mm2; KO, 24.7 ± 3.8 cells/mm2 skin from seven mice). CCR10 is required for memory T cell responses to skin HSV infection. (A) Representative image of WT (red) and CCR10−/− (green) gBT-I CD8+ TRM cells 60 d after HSV infection. (B) Sphericity measurements and average velocity of WT and CCR10−/− TRM cells in the skin. n = 7 mice, one to two videos per mouse, 67–110 individual cells. Black lines are mean ± SEM. Mean sphericity: WT, 0.68; CCR10−/−, 0.70. Mean velocity (μm/min): WT, 0.86; CCR10−/−, 0.96. (C) Mice were cotransferred with equal numbers of CCR10+/− and CCR10−/− gBT-I cells prior to skin HSV infection. Cell numbers were enumerated in the spleen and skin 10 and 30 d postinfection. (D) Ratios of CCR10+/− to CCR10−/− gBT-I in individual mice postinfection. n = 8–10 mice per time point. (E) Number of divided (CTV-low) gBT-I CCR10+/− or CCR10−/− T cells in bLN 3 d after HSV infection. (F) Regulation of CCR10 (EGFP) on gBT-I CD8+ T cells in bLN, spleen, and skin at different times after HSV infection. (G) Graph of CCR10 expression on gBT-I T cells after infection. n = 5–15 mice per time point. Data are shown from two to three independent experiments. *p < 0.05, **p < 0.005. ns, not significant. To directly determine whether CCR10 contributed to memory T cell formation in the skin after HSV infection, CCR10+/− and CCR10−/− gBT-I CD8+ T cells were cotransferred in equal numbers into CCR10+/− mice and T cell responses were examined in the draining bLN, spleen, and skin. 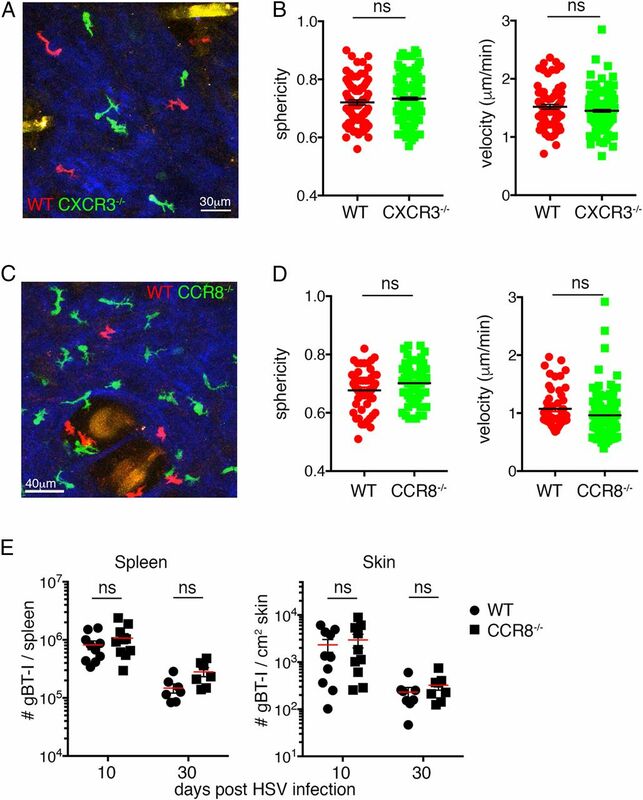 Ten days after infection, numbers of CCR10−/− and CCR10+/− gBT-I T cells were not significantly different in the spleen and skin, although based on mean values 2- to 3-fold more CCR10+/− gBT-I T cells were present in these tissues compared with CCR10-deficient cells (Fig. 5C, 5D). Notably, by day 30, numbers of CCR10−/− memory gBT-I T cells were significantly reduced in the spleen and skin, and this was most pronounced among TRM cells in the skin, which contained ∼12-fold more CCR10+/− gBT-I T cells. This was not due to a delay in the activation or expansion of the CCR10−/− T cells, as proliferation was similar between WT and KO CD8+ T cells in the draining bLN 3 d postinfection (Fig. 5E). Importantly, CD8+ T cells responding to skin infection upregulated CCR10 expression by the first division, with expression among virus-specific T cells highest at the peak of the response (day 7) (Fig. 5F, 5G). CCR10 expression was downregulated on most memory T cells in lymphoid organs and skin >30 d postinfection, indicating that CCR10 expression by CD8+ T cells controls effector and memory cell responses during skin virus infection, possibly by promoting their migration and survival. TRM cells that form in the skin after infection play an important role in rapid protection from reinfection (2). Integral to this role, TRM cells must accomplish effective immunosurveillance of their tissue microenvironment in the search for invading pathogens. The epidermis presents a highly constrained environment for the T cells to navigate, and we have shown that TRM cells adopt a striking morphology that is accompanied by a slow mode of migration (8). Interestingly, epidermal γδT cells and Langerhans cells also adopt dendritic cell morphologies (31), although both of these cell subsets extend thinner and more defined dendrites from largely immotile cell bodies. In contrast, epidermal TRM cells remain motile and extend and retract many cellular protrusions as they move. To facilitate dissection of the molecular mechanisms of TRM cell morphology, we treated the skin of mice with selected compounds to determine the effects on T cell behavior in situ. The actin cytoskeleton was integral to skin TRM cell migration and for the dynamic cell morphology that TRM cells presumably use to probe their environment and generate adhesions to help propel the cells forward. We do not rule out potential effects of topical inhibitor treatment on surrounding keratinocytes, although we predict this would be secondary to the T cell–intrinsic roles of the cytoskeletal components. Similar to T cells migrating in less constrained tissues such as LN, myosin-II was required for TRM cell migration in the epidermis. Myosin-II might therefore help TRM cells to navigate the epidermis by preventing prolonged adhesion to the environment, much like it does in LN (18). Thus, T cell migration within the confined epidermis requires the actomyosin cytoskeleton to facilitate the probing dendritic morphology that is required for navigation in this constrained microenvironment. Our experiments demonstrate a key requirement for microtubules for TRM cell migration in the skin. 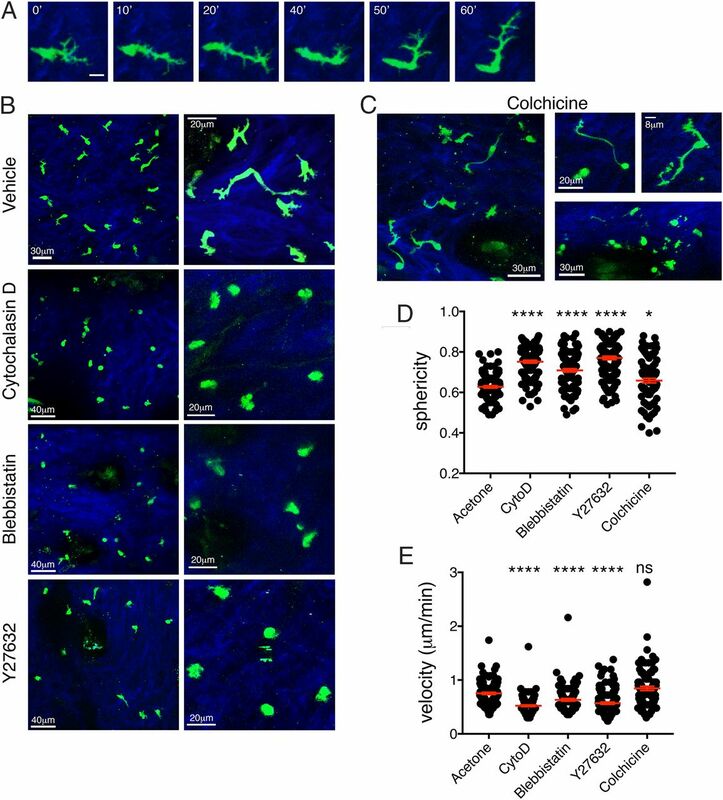 Memory T cells treated with a microtubule-destabilizing drug continued to stretch and project dendrites, but were observed to often overextend and to disintegrate or lose pieces of cytoplasm. These stretched TRM cells maintained a sessile cell body, suggesting that microtubules were required to propel the cells forward. We recently found that the guanine nucleotide exchange factor DOCK8, through CDC42 and p21-activated kinase, is required to coordinate cytoskeletal structures (32). T cells lacking DOCK8 stretched and died (cytothripsis) within constrained environments and were unable to form TRM cell populations in the skin. This disturbed cytoskeletal behavior was accompanied by abnormal positioning of microtubules. We also show in the present study that TRM cells required ROCK for migration in the epidermis. It has been shown that ROCK can influence actomyosin contractility as well as microtubule stability (22). Microtubules have also been proposed to contribute to the deformability of T cells in confined spaces (23). Together with our data in the present study, this suggests that microtubules are critical for the proper coordination of T cell migration in tight cellular environments such as the epidermis. Whether T cells also require microtubules for migration in other tissues is less clear, although we would predict that this would be highly dependent on the tissue microenvironment. We found that although required for long-term retention of skin TRM cells, CD103 expression contributed to cell adhesion but did not control cell morphology. This is in contrast to skin dendritic epidermal γδT cells that were shown to have an altered morphology in the absence of CD103 (25). We also found that PTx-sensitive signals are required for this cellular behavior. Contrary to our prediction that chemokine receptors expressed by skin TRM cells (CCR8, CXCR3, and CXCR6) would influence the motility or morphology of the cells, we observed no difference in responses by TRM cells lacking CCR8 or CXCR3, and only a minor influence on cell morphology by CXCR6. The role that increased CCR8 expression on skin TRM cells versus circulating memory T cell subsets plays is unclear. Potentially, this receptor is important for recall responses or other functions of TRM cells upon reinfection, similar to the function of CCR8 in regulatory T cells in tissues (33). We observed a marked reduction in numbers of skin TRM cells lacking expression of CXCR6. This suggests that CXCR6 is required for the formation or maintenance of TRM cells in the skin, as previously shown for memory CD8+ T cells in the liver (28). Intradermal injection of CXCR6−/− T cells revealed reduced numbers of skin TRM cells, but similar numbers in the spleen, which may indicate a role for this chemokine receptor for local survival. In contrast, no role for the expression of CCR8 by skin TRM cells could be determined in our experiments. Additionally, CCR10 was important for the priming of effector and memory T cell populations after skin HSV infection. CCR10 is implicated in the migration of T cells into the skin during inflammation (29), and early during inflammation the CCR10 ligand CCL27 can be detected in skin-draining LN (34). However, a role for CCR10 in CD8+ T cell responses to virus infection has not been shown. In humans, the vitamin D3 metabolite 1,25(OH)2D3 is processed by dendritic cells and induces CCR10 expression in T cells (35). In mice, this pathway may involve further signals to induce CCR10 on T cells in skin-draining LN. Our results demonstrate CCR10 upregulation on virus-specific CD8+ T cells during the early phase of the immune response. Responses by CCR10-deficient gBT-I CD8+ T cells were impaired, with accumulation of CCR10-deficient TRM cells substantially impaired in the skin, suggesting reduced retention or survival of these cells. However, neither circulating memory T cells nor skin TRM cells expressed CCR10, indicating a likely role for CCR10 during the effector phase in response to skin infection. Whether CCR10 signals are important to expand or sustain CD8+ T cells after other skin infections is unclear and will require further investigation. In summary, we have shown that skin TRM cells adapt to the constrained epidermal environment and migrate using pronounced cellular projections that require functional actomyosin contractility and support from microtubules. Skin TRM cells also required signals from PTx-sensitive receptors for migration and cellular morphology. Although the integrin CD103 and chemokine receptors CCR8, CXCR3, CXCR6, and CCR10 were not critical for epidermal TRM cell migration, formation of skin memory T cells was impaired when CD8+ T cells lacked expression of CXCR6 or CCR10. Further work will be needed to define the roles of these chemokine receptors in T cell migration, survival, and immune responses in peripheral tissues. We thank C. Jones, G. Davey, and M. Damtsis for technical assistance. This work was supported by the National Health and Medical Research Council of Australia.
. 2013. Memory T cell subsets, migration patterns, and tissue residence. Annu. Rev. Immunol. 31: 137–161.
. 2016. Tissue-resident memory T cells: local specialists in immune defence. Nat. Rev. Immunol. 16: 79–89.
. 2013. The developmental pathway for CD103+CD8+ tissue-resident memory T cells of skin. Nat. Immunol. 14: 1294–1301.
. 2013. Sensing and alarm function of resident memory CD8+ T cells. Nat. Immunol. 14: 509–513.
. 2014. T cell memory. Skin-resident memory CD8+ T cells trigger a state of tissue-wide pathogen alert. Science 346: 101–105.
. 2014. Persistence of skin-resident memory T cells within an epidermal niche. Proc. Natl. Acad. Sci. USA 111: 5307–5312.
. 2012. Tissue-resident memory CD8+ T cells continuously patrol skin epithelia to quickly recognize local antigen. Proc. Natl. Acad. Sci. USA 109: 19739–19744.
. 2013. Transcriptional downregulation of S1pr1 is required for the establishment of resident memory CD8+ T cells. Nat. Immunol. 14: 1285–1293.
. 2008. An indispensable role for the chemokine receptor CCR10 in IgA antibody-secreting cell accumulation. J. Immunol. 181: 6309–6315.
. 2015. Spatiotemporally distinct interactions with dendritic cell subsets facilitates CD4+ and CD8+ T cell activation to localized viral infection. [Published erratum appears in 2015 Immunity 43: 615.] Immunity 43: 554–565. 2013. Effector T-cell responses in non-lymphoid tissues: insights from in vivo imaging. Immunol. Cell Biol. 91: 290–296.
. 2009. Mechanical modes of “amoeboid” cell migration. Curr. Opin. Cell Biol. 21: 636–644.
. 2010. Confinement-optimized three-dimensional T cell amoeboid motility is modulated via myosin IIA-regulated adhesions. Nat. Immunol. 11: 953–961.
. 2011. In vivo analysis of uropod function during physiological T cell trafficking. J. Immunol. 187: 2356–2364.
. 2001. A pivotal role of Rho GTPase in the regulation of morphology and function of dendritic cells. J. Immunol. 167: 3585–3591.
. 2010. Critical roles for Rac GTPases in T-cell migration to and within lymph nodes. Blood 116: 5536–5547.
. 2010. Microtubules regulate migratory polarity through Rho/ROCK signaling in T cells. PLoS One 5: e8774.
. 1997. Microtubule retraction into the uropod and its role in T cell polarization and motility. J. Immunol. 159: 1063–1067.
. 2009. Memory T cells in nonlymphoid tissue that provide enhanced local immunity during infection with herpes simplex virus. Nat. Immunol. 10: 524–530.
. 2008. Integrin αE(CD103)β7 influences cellular shape and motility in a ligand-dependent fashion. Blood 112: 619–625.
. 2012. Long-lived epithelial immunity by tissue-resident memory T (TRM) cells in the absence of persisting local antigen presentation. Proc. Natl. Acad. Sci. USA 109: 7037–7042.
. 2016. Liver-resident memory CD8+ T cells form a front-line defense against malaria liverstage infection. Immunity 45: 889–902.
. 2014. 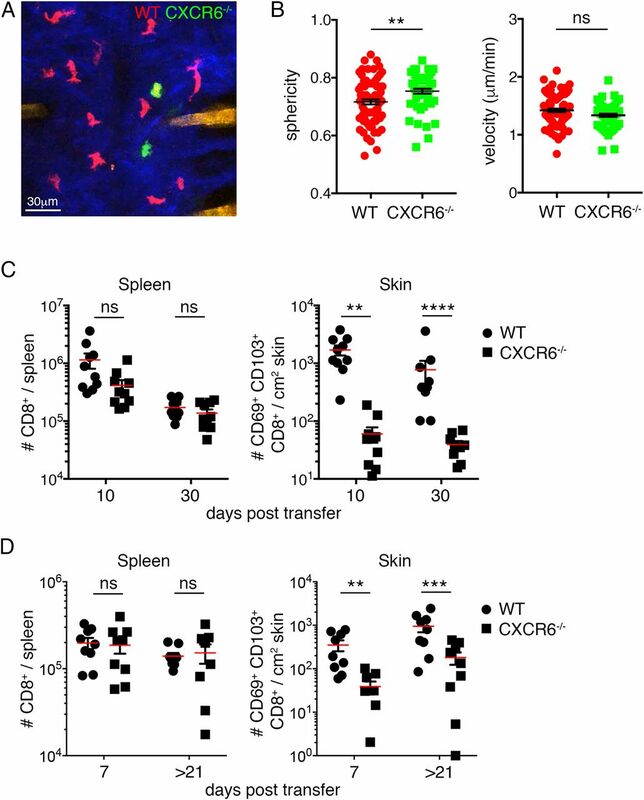 The chemokine receptor CXCR6 is required for the maintenance of liver memory CD8+ T cells specific for infectious pathogens. J. Infect. Dis. 210: 1508–1516.
. 2014. CCR10 regulates balanced maintenance and function of resident regulatory and effector T cells to promote immune homeostasis in the skin. J. Allergy. Clin. Immunol. 134: 634–644. e610.
. 2012. Body-barrier surveillance by epidermal γδ TCRs. Nat. Immunol. 13: 272–282.
. 2014. DOCK8 regulates lymphocyte shape integrity for skin antiviral immunity. J. Exp. Med. 211: 2549–2566.
. 2017. CCR8+FOXp3+ Treg cells as master drivers of immune regulation. Proc. Natl. Acad. Sci. USA 114: 6086–6091.
. 2008. Cutting edge: rapid accumulation of epidermal CCL27 in skin-draining lymph nodes following topical application of a contact sensitizer recruits CCR10-expressing T cells. J. Immunol. 180: 6462–6466.
. 2007. DCs metabolize sunlight-induced vitamin D3 to “program” T cell attraction to the epidermal chemokine CCL27. Nat. Immunol. 8: 285–293.